Admittedly, the bottles sat atop our side table for a couple weeks. Not sure exactly how I wanted to enjoy my first cocktail made with this amazing liquor, I waited until inspiration hit- I wasn't about to screw this up. Inspiration cam in form of a Strawberry Rhubarb Cakelette (recipe coming soon!) 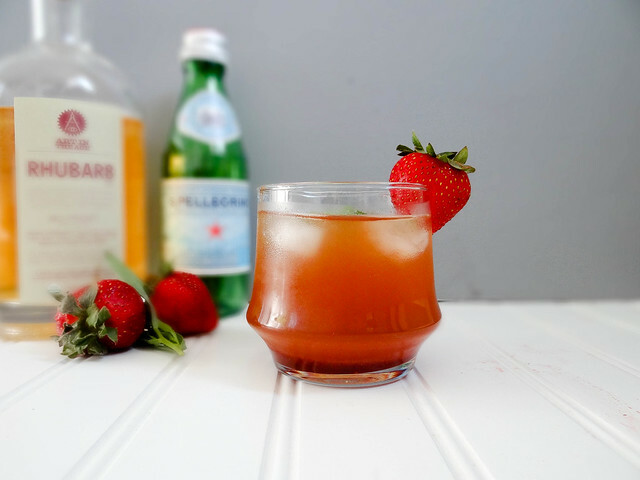 - a bit of strawberry rhubarb syrup was leftover from the cakes, it was just begging to be made into a summer cocktail. This is the kind of drink that makes you feel grown up - the method of creating the drink is relaxing in itself. 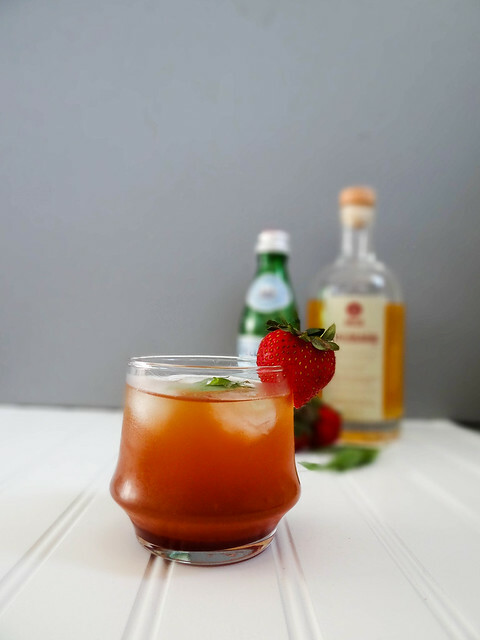 Fresh tarragon from the garden muddles with a syrup made from freshly picked strawberries & rhubarb from the market made a tasty little drink indeed. One that is made for sipping and not as a beer pong chaser (Justin and I make a pretty unbeatable beer pong/beruit team). 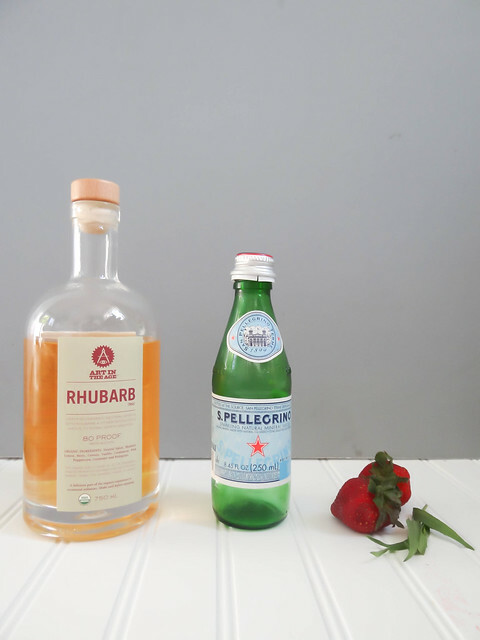 If you don't fancy yourself a cocktail or two, you can easily make this without the Rhubarb- but really, if you have the means and the ability to track Art in the Age Rhubarb (and are able to enjoy alcohol), do it this weekend - I promise you won't regret it. in a small sauce pan combine 1/2 cup sugar, juice of 1emon, 3/4 cup chopped rhubarb & 11 strawberries quartered. Bring to a boil over high heat, reduce to medium low and simmer until strawberries and rhubarb begin to soften and breakdown- about 5-10 minutes. Remove from heat, pour mixture into a fine mesh sieve set over a bowl and strain. Reserve the strawberries and rhubarb to use when baking or to top your morning oatmeal. 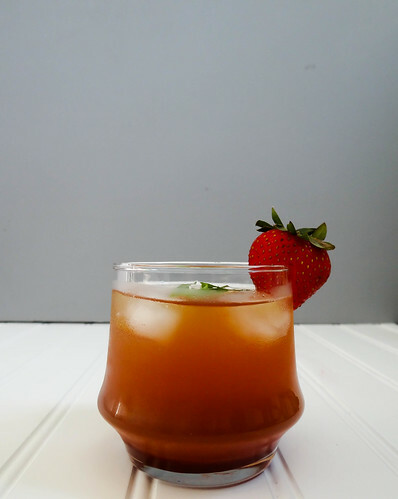 In a low ball glass, muddle 2 tbsp syrup with tarragon. 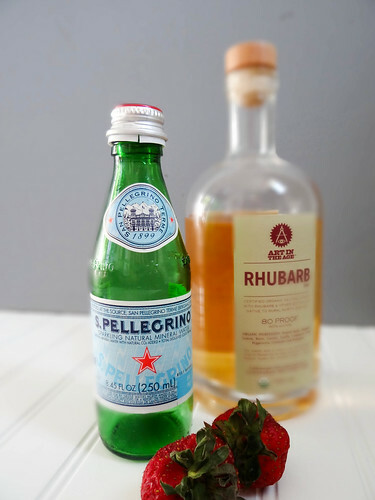 Add crushed ice, the shooter of Rhubarb liquor- top off with San Pellegrino or sparkling water. 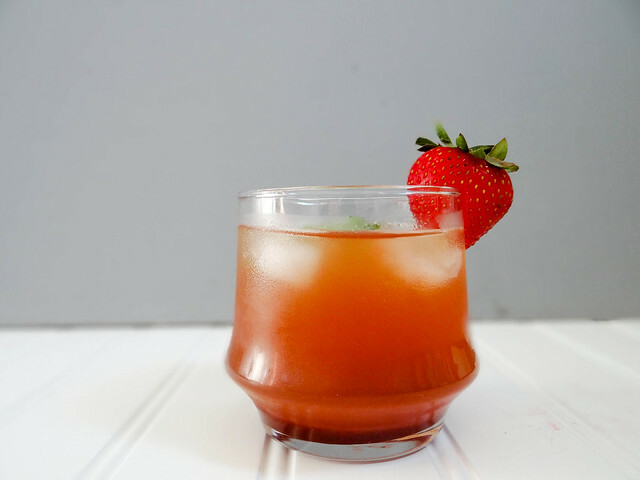 i'm not a drinker, let alone cocktail girl, but this looks delicious! Hi! I LOVE your site- your food always looks so thoughtful and tasty. I was wondering where you were able to find this? I heard about these from a friend and checked one local liquor store, but they weren't carrying any. I think you might be near me, so I was wondering if you woudn't mind passing the info along. Hi! Thanks for stopping bye :) I found them at the Gilford NH r liquor store and they carry them at the Center harbor store as well- if you sarch art in the age on the NH Liquor store site it will provide you with all the store in NH that carry Art in the Age - if you dont mind me asking- where are you from? Oh, great! I'm in Sanbornbton and the liquor store in Franklin doesn't seem to carry much outsdie the usual suspects. I've been making a rhubarb syrup to mix into vodka sodas at home, but I'm excited to try out this fancy treat. Thanks again- and please keep up the beautiful recipes. I'm excited to see what you'll be up to with all the fresh, local NH produce that's starting to come in! This line is definitely worth the extra cost- I am so excited to try the root, we are waiting for our homemade root beer and hope to try out some grown up root beer floats! I love that you shared this recipe! Sounds amazing (as always)! We get fresh rhubarb from one farm near us and another of our states most famous strawberry farms is just up the street. I think you gave me a super new recipe to try and utterly organic and fresh. THanks for a great post! love that glass! those flavors have got to be so interesting. hubbs will love this! If only the LCBO (liquor stores in Ontario) carried this brand. But alas they do not :( looks simply awesome though! I love me a good happy hour drink too! must seek this out! sounds awesome! I would go all in with Strawberries! 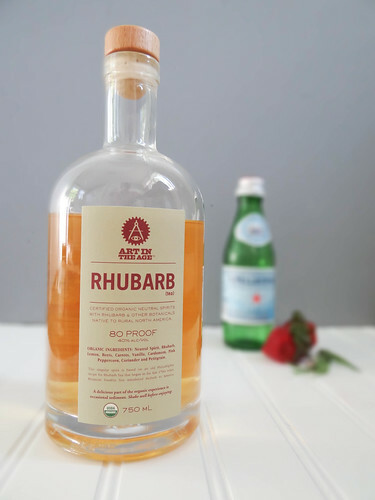 Rhubarb liqueur? Wow! Very neat. I bet this would be so delicious! Definitely going to see if I can find some in stores here! I'm super fired-up to try this drink ! What lovely look and texture ! 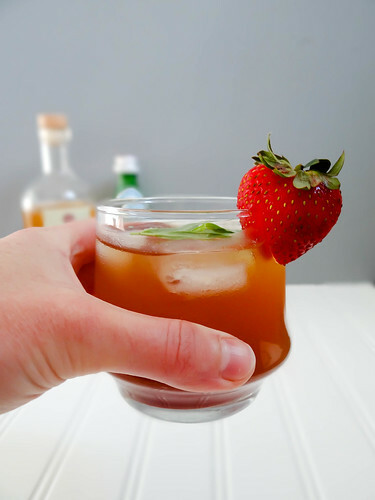 I'm not a cocktail drinker but I must say that this looks wonderful!